A group of Zimbabwean nationals residing in Namibia called on President Emmerson Mnangagwa to resign during a protest in Windhoek. 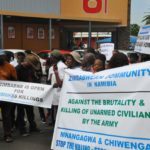 The group protested against the violent crackdown by security forces on Zimbabwean civilians over the past week. 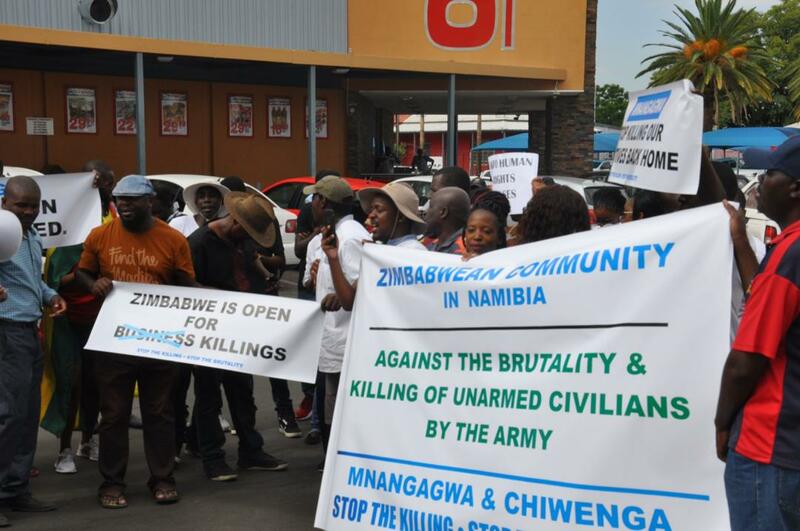 They marched along Windhoek’s Independence Avenue to the Zimbabwean embassy to hand over a petition in which they strongly condemn Zimbabwean government’s use of live ammunition on unarmed, lawfully protesting civilians. The group called on President Mnangagwa and Vice President Constantino Chiwenga to resign. The protesters in the petition also lamented the obstruction of freedom of expression, repression of freedom of assembly and unconstitutional suppression of individual human rights of its citizens in their country of origin. At the same time the protesters called on a peaceful resolution in Zimbabwe, following a civil uprising after Mnangagwa implemented an increase in fuel prices of more that 150 percent before leaving the troubled country on a tour of Russia and Eastern Europe. According to a collection of Zimbabwean human rights groups at least 12 people have been killed in the subsequent violent suppression of protesting Zimbabweans by that countries security forces left. At least 78 people have been wounded by live bullets and more than 240 were subjected to assault, torture, inhumane and degrading treatment. The Zimbabwe Human Rights NGO Forum in a statement also says 466 people have been arbitrarily arrested or detained in what it calls “massive” human rights violations. The statement says children as young as 9 have been reportedly tortured as security forces ransacked private homes. The NGO stated that it is “regrettable” that Zimbabwe’s government is blaming civil society leaders for some of the country’s worst unrest in years. Rofina Chikava, the Zimbabwean Ambassador to Namibia, was not available to receive the petition.